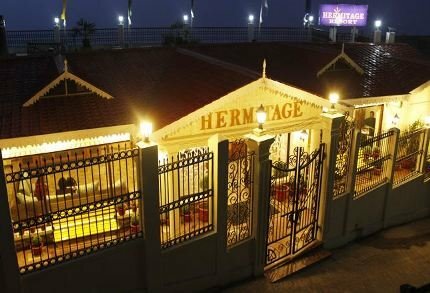 This hotel opened in April 2015 and is owned by a local of Darjeeling. It's located on Hermitage Road and hence the name. The location is actually at the junction of Mall Road East and Hermitage Road, the Chowrasta Mall is only about 4-5 minute walk from the hotel. 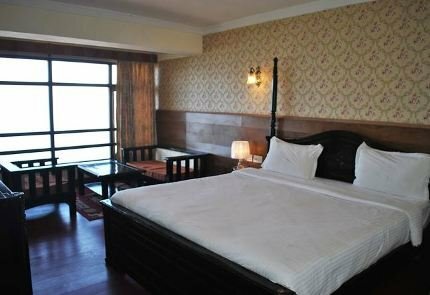 Such premium price tag is essentially due to the awesome view of Kanchenjunga peaks the hotel offers from all its 20 rooms. The views on a clear day from the large windows of the rooms can't get any better in Darjeeling. You don't need to go to Tiger Hill or any other place to watch the stunning sunrise on Kanchenjunga snow peaks and watch the spectacle of emerging hues of the sun. Taxi will drop you near Bhanu Bhawan (aka Gorkha Rang Manch) on Mall road (west) from where its about 2-3 minute walk on a flat terrain. Being near Raj Bhavan, the hotel is in a pedestrian only zone and vehicles are not allowed here. So you need to accept that little walk along with your luggage. The entrance and the impressive lobby with Italian marbled floor are on the road level. However all rooms are in the lower levels. The 20 rooms are actually spread across four floors, so higher you stay, less number of stairs you need to negotiate and the view too would be a bit better. There are two types of rooms. The higher range are in the upper floor near the lobby. There is hardly any other difference between the two types. Size and amenity wise they are virtually the same. Another very impressive part of the hotel is it open terrace offering wonderful views of the peaks. This is an ideal place to have a cup of Darjeeling tea as you watch the views on a clear sunny day. The rooms have standard amenities including LCD TVs, tea/coffee maker, attached western style toilets etc. Although wi-fi is offered free, you can hardly get signals from the rooms and the speed is slow. You can however get signal at the lobby / lounge area and the dining room when in operation. It's better to carry your own data card or internet plan on your mobile if you need to work on internet. The multi cuisine restaurant seating around 45 persons is located at the lobby level. While it serves Indian, Chinese and some continental dishes, the food by taste is less than average and although the menu is quite exhaustive, you may hardly find any variations. Another area where this hotel can surely improve is the service. Although the hotel claims round the clock room service, you may actually find it hard to get any service in the rooms. And when you can get hold of a waiter, the nonchalant attitude shows the lack of training and motivation. This is where the hotel loses the value for money for hefty tariff it charges. They can easily improve in service and but that would require a professional management. And then this hotel can really become a great asset to the tourists as the location of the hotel is unparalleled. The hotel has undoubtedly one of the best views of Kanchenjunga peaks. And designing a hotel to have all its rooms equally good views is not easy. So you can't go wrong with the views whichever room you get. However the upper level rooms are more convenient but costlier. But what happens on days when there are no views due to cloud or fog? The value for money can then be seriously questioned, because by ways of amenities and service, the hotel lags behind many in its category. And no wonder you can expect hefty discounts during off season. As I already mentioned, the service has to vastly improve for this hotel to make a good name for itself. Although the intentions are good, they are far from perfect. Even housekeeping services are sometimes not up to the mark. Food choices are often limited and not impressive at all. If views of snow peaks are your main objective along with a comfortable stay, then you can certainly choose this hotel although in my opinion it's overpriced for what it offers in totality.